Edited by Shufunotomo Co., Ltd. I remember doing origami for the first time. I was in middle school and my friend and I would write each other notes and fold them up into fun origami shapes before passing them to each other. We made boxes, shapes, animals, and balloons. We’d always try to one up the other with a new cool design, and before long, I became a paper folding queen! Now, several years later, my love of origami still remains strong, only now it’s for a different purpose. As a renegade baker, I look to origami to package my baked goods, as well as the crafts and projects I sell. That’s why I’m so glad that I found Practical Origami: Folding Your Way to Everyday Accessories. Practical Origami is filled with great uses for paper, from unique and clever gift wrapping ideas to coasters, cards, and great organizational ideas. Each project is laid out step by step, with helpful illustrations and directions that are simple and easy to follow. As I worked my way through Practical Origami, I came across the perfect Father’s Day craft…these cute Shirt and Tie Cards and Envelopes. They’re really the cutest things ever and so easy to make. You can fill them with a gift certificate, gift card, or just a loving and meaningful message for dad. 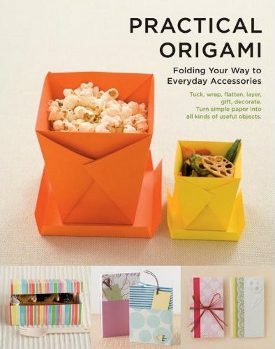 With the help of Practical Origami, you may never have to buy a card, gift bag, gift box, or food container ever again!